11 stycznia 2015 o godz. 14:30 w Jezuickim Ośrodku Milenijnym przy 5835 W. Irving Park Rd. w Chicago odbędzie się doroczne spotkanie opłatkowe członków Związku Lekarzy Polskich w Chicago. Come and join us on January 11th, 2015 at 2:30 PM in the Jesuit Millennium Center at 5835 W. Irving Park rd. 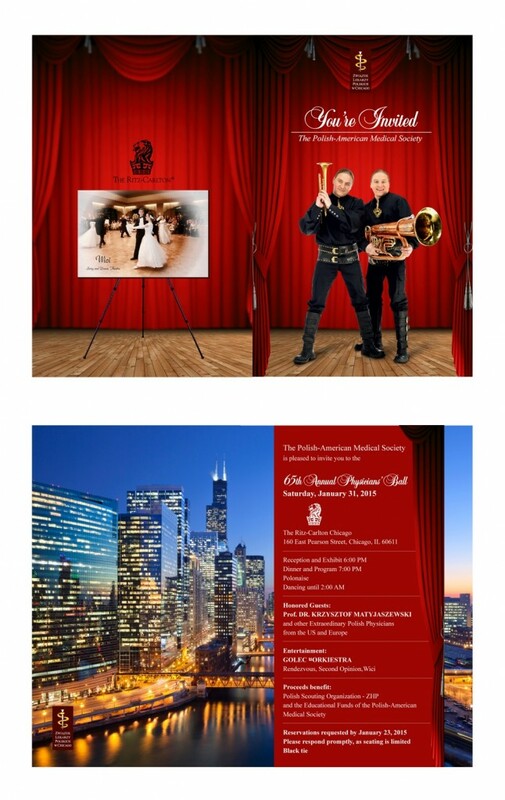 Chicago to celebrate Christmas with the Polish American Medical Society of Chicago. Rozpoczniemy tradycyjnie mszą świętą. W programie również skromny poczęstunek, upominki dla dzieci oraz wspólne śpiewanie kolęd. We will start with a traditional holy mass. The program also includes a small meal, gifts for children, as well as group christmas carol singing. Nasze spotkanie w tym roku uświetni wspaniały wokalista jazzowy Marek Bałata. Our meeting this year will feature the great polish jazz vocalist Marek Bałata. Będzie możliwość nabycia płyt CD z dedykacją artysty. You will be able to purchase a CD and have it dedicated by the artist himself. Serdecznie zapraszamy wszystkich lekarzy wraz z rodzinami. We would like to cordially invite all physicians and their families. Aby pokryć koszty występu artysty, prosimy składać dobrowolne donacje na ręce organizatorów. To cover the cost of the artist’s performance, please submit a voluntary donation to the organizers. On December 5-7, 2014 the Regional Medical Center of Warsaw celebrated the 25th anniversary of the polish medical self-government. The celebration was organized by the Naczelna Izba Lekarska (NIL), also known as the Polish Chamber of Physicians. Present amongst the delegation representing the global and national medical and dental associations, were the president of PAMS Dr. Kornelia Król, the president of the Federation of Polish-American Medical Organizations Dr. Marek Rudnicki, the vice president of the federation, Dr. Janusz Kasina from Sweden, and honorary president Dr. Bronisaw Orawiec. The series of meetings began on Friday in the Polish Parliament. Foreign guests, members of the Polish Chamber of Physicians and nine past health ministers from 1989 to the present were in attendance. The health ministers shared their thoughts on health care and how much it has changed since they were in office. Later in the afternoon, the deputy speaker of the Senate of Poland, surgeon Stanisław Karczewski held a meeting. Foreign guests, representing 30 different medical organizations worldwide attended. Dr. Karczewski underlined that the Chamber of Physicians would also be celebrating 25 years of practicing in a free Poland, just as the senate. Amongst the 100 senators in Poland, eight of them are physicians who are actively engaged in running the self-government. During the meeting, foreign physicians had the opportunity to present their organizations, as well as familiarize themselves with the legislative processes of Poland. On Saturday, December 6, at the Sofitel Victoria hotel, the Polish Chamber of Physicians held a meeting and historical session. Later that afternoon, Cardinal Nycz dedicated a mass to the physicians at Holy Cross Church (Kościół Św. Krzyża). The main event was the anniversary gala at the Grand Theater (Teatr Wielki). Actors Piotr Fronczewski and Ewa Wiśniewska beautifully prepared it. There were performances by the Płock Symphonic Orchestra as well as by the actor/singer Janusz Radek. This interesting concept of celebrating the 25th anniversary of the polish self-government was eloquently covered by the polish physician’s newspaper “Gazeta Lekarska”. We, as the delegation, stressed our desire to maintain contact and to continue to actively cooperate with the Polish Chamber of Physicians.